Ayobooks’ A is for Àdìre! Yoruba Cultural Dictionary introduces young readers and their families to the language and culture of the Yoruba. This glossy, easy-to-hold–and-use Yoruba dictionary targets children who understand English and try to acquire the Yoruba language. The vocabulary is simple with each word defined in English and pronunciation triggered by familiar or adaptable English sounds. The dictionary taps into Yoruba cultural information, an aspect that also characterizes Yoruba training for young people. The bold, clear, relevant illustrations provide clarity about the meanings provided in English. A map shows southwestern Nigeria as the ancestral homeland of the Yoruba-speaking people and notes the presence of the Yoruba in Republics of Benin and Togo. Like any typical dictionary, this publication is arranged alphabetically. Each letter is boldly written and capitalized to attract the attention of users. Pronunciation clues help learners to articulate the words correctly. 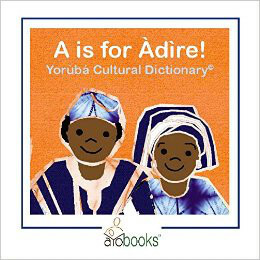 Each page contains one word except the letter “A” which has two: “Adire” and “Asọ Oke.” Through the letters and the words formed from them, appropriate aspects of Yoruba culture are emphasized. For example, A, B, G, GB and H show traditional Yoruba clothing, images under D and E present Yoruba ideals of female beautification, and those under “Ẹ” and “J” relate to Yoruba foods. A few improvements, however, are needed. The last letter in “Àdìre” on the cover page should have a diacritic under the “e” and appears in the word as it is now: “Àdìrẹ”. On the page with the letter “A”, the diacritic that should be under “e” to generate “ẹ” falls under “r” to form a letter that does not exist in Yoruba. The inclusion of the copyright symbol (©) at the end of the subtitle is not necessary. The map of Africa at the beginning of the book could use a title. Another issue is that the last page of the book is irrelevant; it contains a list of Yoruba alphabets and Yoruba numbers –thus shifting the attention of the users from the book as a dictionary to the book as a reading material for learning also the alphabet and numbers. In sum, this new dictionary has many assets that facilitate learning: big fonts, fewer words, simple definitions, pronunciation prompter, cultural dimension, alphabetical arrangement, colorful and big images, aesthetical display, glossy cover, and clear print. It uses the approaches that are common among the indigenous speakers of Yoruba. The book is recommended for schools and homes that care about helping children to acquire preliminary Yoruba communication skills and Yoruba cultural awareness.